One of the major advantages of building with shipping containers is the relative ease of transport - that's what they were designed for right? 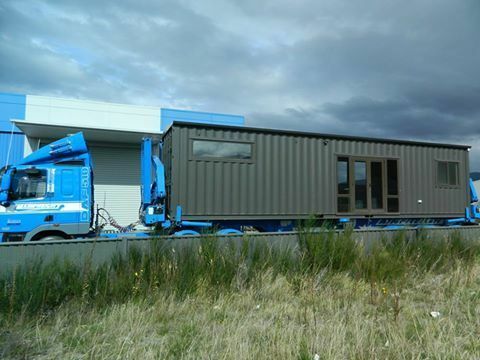 Whether you have purchased a container or had Taylor Made Container Homes build your dream home, we can arrange delivery to any site within New Zealand. We use specialist companies to transport our fully self-contained units to wherever your heart desires - whether it's a sleep-out on the side of your house, an on-site office or a private getaway stashed in the back of beyond - we've got you covered. The real benefit of a container home, as opposed to a standard pre-fab, is container homes are less likely to warp or move during delivery due to their shipping container shell. This means they’re ideal for temporary buildings as they’re incredibly relocatable and durable. They’re also ideal for modular homes, for example, they can expand with your family – need an extra bedroom and bathroom? Just add on another container. They’re a good option for those consider workers accommodation too, as they can grow with your business. What is the process involved in delivering a shipping container home? You’ll need consent for foundations and building consent – we can help with that. We work with you to design and build a container home or building to your specifications. Once the build is underway, it’s completed undercover so there are no delays due to weather conditions. Once complete we arrange shipping to your destination. As it’s all prefabricated if there’s more that one modular, they can easily lock together. We arrange for a transporter with a Hiab or swing lift to deliver and put in place the container home. Once in place, we can arrange services to be plumbed in and all fittings to be approved. Time to enjoy your container home, and if you wish to extend it or move it at any stage, it’s a pretty simple process. Thinking a container home might be the best fit for you? Enquire today by giving Darryl a call on 027 923 7039.